T.S. Eliot lamented that "April is the cruelest month". He may have been overly optimistic. The weather is the weather; we just get in the way. We make plans and then shake our fists at the sky when things don't work out. I have to remember this: the atmosphere owes us no favors. That point will become evident this weekend as a slow-moving storm dumps significant snow on the southern third of Minnesota. This is a long-duration snow event; accumulating snow finally winds down during the day Sunday. By then much of the metro may have a sloppy 7-15 inches on the ground - with the best chance of 12 inches or more over the southern suburbs and southern Minnesota, generally south of the Minnesota River. A high April sun angle may keep freeways wet and slushy, but travel should be a mess. If it has to snow, let's at least go for a record! If MSP picks up more than 11.5 inches of snow (not impossible) this will be the snowiest April on record for the Twin Cities. Yep, we got our Winter Mojo back. Snow lovers, have you had enough? Models show a few 60s by the last week of April, when spring finally saunters into Minnesota. Right on schedule. Updated Road Conditions. To say it's a mess out there would be a horrific understatement. So I won't say it. Before you even think of venturing out today you migh want to check MnDOT's 511 web page showing updated travel conditions around the state. Why I'm Nudging Snowfall Totals Upward. There's still a wide range in model solutions, but based on last night's model runs I'm more inclined to see 8" as a minimum, with metro totals more in the 8-15" range by Sunday PM (the best chance of over a foot southern suburbs and south of the Minnesota River). NAM Solution. Here is the (jaw-dropping) NAM guidance from the 00z run, showing over 20" of snow for the metro. I still think that number is high, but last night's NAM printed out roughly 2.5" of liquid, most of it falling in the form of snow. My confidence level is growing that 15-16" is not out of the question, especially south metro. Map: NOAA and pivotalweather.com. GFS Solution. Based on previous performance I'm more tempted to go with a solution in line with what the 00z GFS was showing, with the heaviest amounts over the south metro and southern Minnesota, where 13-18" snow totals by Sunday evening can't be ruled out. Good grief. There are colors on this map I hope to never see again in April. Historic April Snowstorms. The Minnesota DNR has a timely post with some perspective: "...The largest April snowstorm in the Twin Cities happened on April 14, 1983. A strong area of low pressure had ample moisture to work with and deepened over northern Iowa as it moved to the east and northeast. The event started as rain on the 13th and changed over to snow during the wee hours of April 14th. Persons in east central Minnesota were surprised to wake up to a foot of snow on the ground with brilliant morning sunshine. The grand total at the Twin Cities airport from that storm was 13.6 inches. The Metrodome deflated for the third time since its construction in this storm. (The first two times were Nov 21, 1981 and December 30, 1982.) Over 400 schools canceled class on April 14 and the University of Minnesota shut down at 2:30pm. Residential mail deliveries and pickups were canceled for only the third time in 20 years. The Twin Cities International Airport was shut down for 5 hours from 9am to 2pm on the 14th..."
Top 20 Snowfalls in Twin Cities History. This record goes through 2016. Last winter was a dud in terms of snow so I believe the data is still valid. Here's a clip from a Minnesota DNR post: "The prospect of a large snowstorm often gets people wondering about where the event will stand historically. So, what does it take to make the all-time top-20 for the Twin Cities? (Above) we have listed the 20 largest continuous snowfall events on record in the Twin Cities, using data back to 1891. Many of these storms were multi-day affairs. Some, like the Armistice Day Storm and the 1991 Halloween Blizzard , were produced by massive and intense areas of low pressure and were accompanied by howling and even damaging winds. Others, like the March 8-9, 1999 surprise , had a softer touch. But many of these storms live in some sort of infamy, like the blizzard of December 10-11, 2010 , which will be remembered by many as the third and final "domebuster" snowstorm, resulting in significant damage to the roof of the former Metrodome . We will update this list as new snowstorms replace older ones..."
Latest First 60F in the Twin Cities. The latest on record was in 1874, on April 29th. Most recently MSP didn't hit 60 until April 26 in 2013. Only 20 years on record have had their first 60 degree day on or after April 13th. Source: meteorologist D.J. Kayser at Praedictix. Please Don't Mess With Us. 60s after April 26? At some point we have to turn the corner and fast-forward into spring. After a February-like weekend highs reach the 40s next week; maybe 50F a week from Sunday with a mild finish to the month. That would be nice. ECMWF for the Twin Cities: WeatherBell. A powerful spring storm moving out into the central United States is bringing the threat of blizzard conditions, severe weather and fire weather concerns over the next few days. The cold side of this system will bring a band of at least 6-12”+ of snow from Nebraska and South Dakota into the upper Great Lakes. 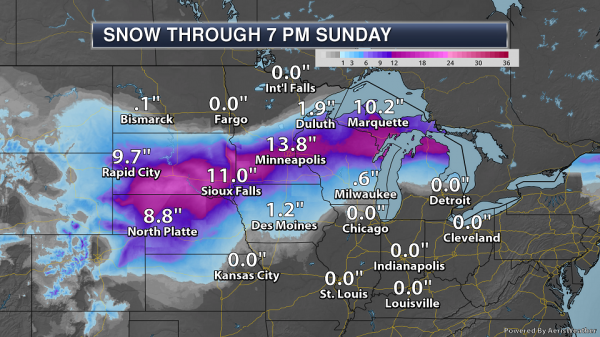 Some areas of the upper Midwest could end up with 18”+ of snow by the time the snow winds down this weekend. High winds of 40-60+ mph will accompany the snow, creating blizzard conditions across parts of this region. 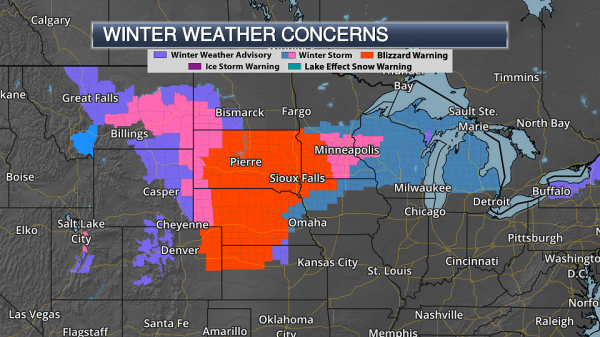 Numerous Blizzard Warnings and Winter Storm Warnings are in effect. 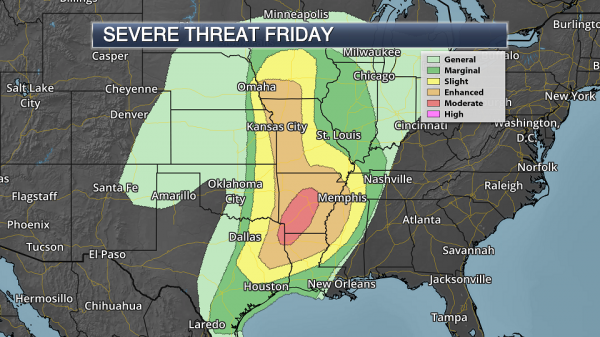 A Moderate Risk of severe weather is in place across portions of Arkansas, Texas and Louisiana this afternoon into the overnight hours for the potential of strong tornadoes, damaging winds and large hail. This accompanies a large Enhanced Risk of severe weather from Iowa into the lower Mississippi Valley. Another day of severe weather is expected tomorrow from the Ohio Valley to the Gulf Coast. Extreme fire weather conditions continue today from New Mexico to Oklahoma, where low humidity values in combination with very strong winds and dry fuels will allow any fires that develop to quickly grow into potentially large, fast-moving wildfires. Potent System Taking Shape. A strong system is taking shape this morning across portions of the central United States, bringing strong winds, heavy snow and severe storms over the next several days. Heavy snow is already falling this morning from Colorado into the Dakotas, with I-90 shut down between Rapid City and Murdo in South Dakota due to heavy snow and strong winds that are making safe travel impossible. Severe Thunderstorm Warnings have already been issued in parts from southeastern South Dakota into southwestern Wisconsin, with a 78 mph wind gust reported earlier today near Rushmore, MN. 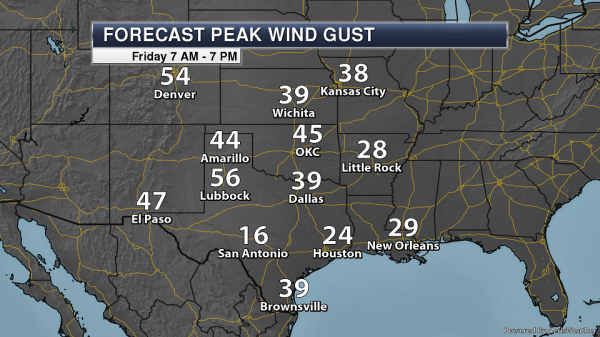 Further south, strong winds over the central and southern Plains have already gusted over 40 mph in spots, with a 61 mph wind gust reported at Guadalupe Pass, TX. Map credit: AerisWeather. Rapid City, SD, which is under a Blizzard Warning until 6 AM Saturday for 8-14” of snow with wind gusts as high as 40-45 mph. Sioux Falls, SD, which is under a Blizzard Warning from 7 PM Friday until 7 PM Saturday for 10-15” of snow (isolated 18” amounts) with wind gusts as high as 50 mph. North Platte, NE, which is under a Blizzard Warning from 1 PM Friday until 7 PM Saturday for 6-9” of snow and wind gusts as high as 60 mph. Goodland, KS, which is under a Blizzard Warning from noon Friday until 6 PM Saturday for 2-5” of snow and wind gusts as high as 60-80 mph. Minneapolis/St. Paul, MN, which is under a Winter Storm Warning from 10 PM Friday until 1 AM Sunday for 10-14” of snow and up to 0.10” of ice. Green Bay, WI, which is under a Winter Storm Watch from 1 AM Saturday until 12 AM Monday morning for 4-9” of snow and up to a quarter inch of ice. Grand Rapids, MI, which is under a Winter Storm Watch from 5 AM Saturday until noon Sunday for 0.30”-0.75” of ice. Marquette, MI, which is under a Winter Storm Watch from 8 PM Saturday until 8 AM Monday for 8”+ of snow. Snow Through Sunday Evening. A heavy band of 6”+ is still expected to fall from the Dakotas and Nebraska northeastward across Minnesota, Wisconsin and Michigan through the weekend. In some of these areas, snow fall totals could approach – if not exceed – 18” through the end of the weekend. This snow will impact travel across the region, with difficult to impossible travel possible. 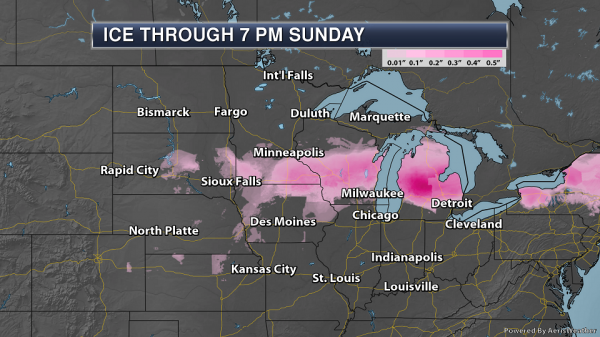 Ice Through Sunday Evening. The freezing rain and ice potential will be the highest from southern Minnesota into parts of northern Michigan, where icing totals of 0.10-0.40” will be possible. Parts of western Michigan could see ice totals that approach three-quarters of an inch. This will potentially cause power outages and tree damage across the region, with travel becoming difficult if the ice accumulates on roadways (particularly bridges and overpasses). Whiteout Conditions Expected. 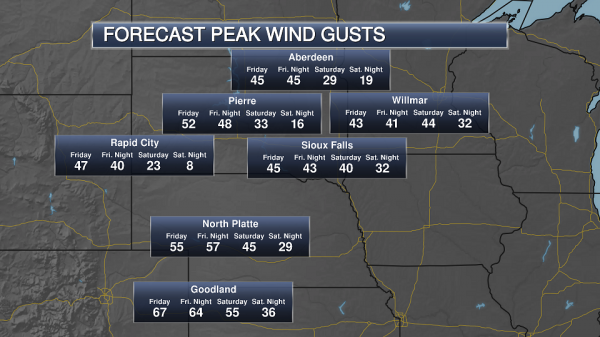 Winds are expected to gust above 40 mph across parts of the Plains and upper Midwest with this system. This will have the biggest impact where snow will fall, as it will create blowing and drifting snow that would lead to whiteout/blizzard conditions. This is why Blizzard Warnings have been issued in associated with this storm. Severe Threat Friday. 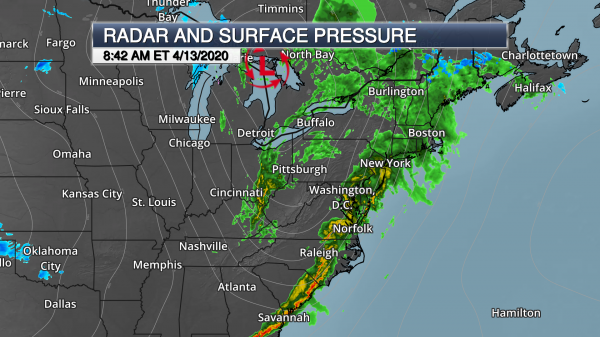 In the warm sector of this system, we are watching for the threat of severe storms. Numerous strong to severe storms are expected from Iowa south into the lower Mississippi Valley this afternoon into tonight. 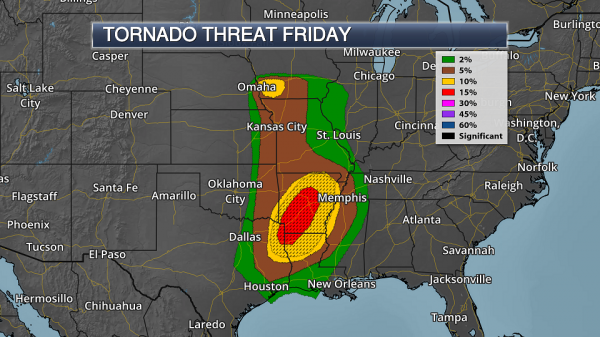 The Storm Prediction Center has issued a tornado-driven Moderate Risk area of severe storms across portions of Arkansas, Texas and Louisiana, with a large Enhanced Risk area stretching north into Iowa. Some of the larger cities included in the Moderate Risk area include Little Rock (AR), Shreveport (LA) and Texarkana (TX), and some of the cities in the Enhanced Risk include Kansas City and Springfield (MO), Fort Smith (AR), Memphis (TN), Monroe (LA) and Tyler (TX). Especially in and right directly surrounding the Moderate Risk area we will be watching the potential for numerous storms capable of tornadoes (some of which could be strong) as well as damaging winds and large hail. Tornado Threat Today. There are two areas where the tornado potential is heightened today. The highest potential is in and around the moderate risk area. The area covered by the moderate risk has a 15% probability of tornadoes today, with a 10% probability surrounding it across parts of the enhanced risk area. A “hatched” area also covers locations under most of the 10-15% southern tornado risk area. This is where we could see significant tornadoes later today, with that “hatched” area indicating at least a 10% threat of strong, destructive tornadoes. There is also a 10% tornado probability over parts of southwest Iowa, where conditions could become favorable for tornadoes. Damaging Wind Threat Today. A 45% probability of damaging winds exists across parts of Arkansas, Tennessee, Mississippi and Louisiana as we head into the evening and overnight hours. During this time frame individual storms are expected to form into one or more lines of storms, capable of widespread damaging winds (and maybe an embedded tornado or two) as they continue to move eastward. Severe Threat Saturday. 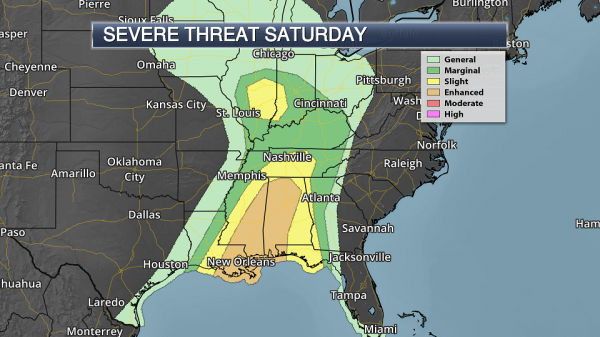 The severe threat will continue east ahead of the cold front associated with this system Saturday, with the potential of severe storms from the Ohio Valley south to the central Gulf Coast. 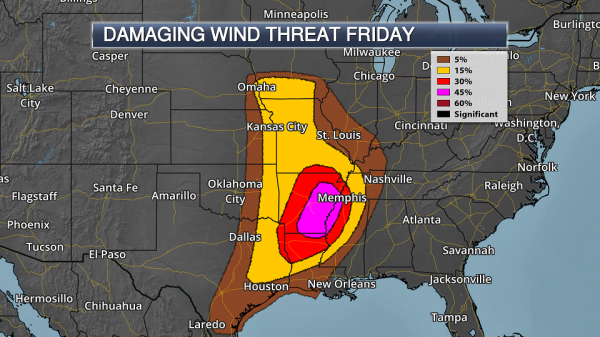 The greatest potential of severe storms will exist across parts of the Mid-South to the central Gulf Coast, where an Enhanced Risk of severe storms is in place. Cities included in this Enhanced Risk include New Orleans and Metairie (LA) as well as Birmingham, Huntsville, and Mobile (AL). While it appears the greatest threat will be with a line of storms capable of damaging winds moving through the region, if some isolated storms can form out ahead of that line the threat of large hail and a tornado or two will be present. Extreme Fire Danger Today. 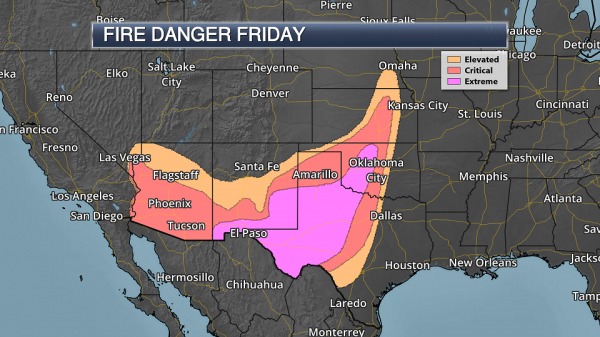 Today will be another dangerous fire weather day across parts of New Mexico, Texas and Oklahoma due to an extremely dry air mass and very strong gusty winds. Due to these conditions and dry fuels in place, an extreme fire danger is in place across this region. These conditions do favor large, fast-moving wildfires if we do have fires develop later today. Potential Wind Gusts. Any fires will certainly be fanned by gusty winds across the region today, with wind gusts of 40+ mph expected. High Wind Concerns. 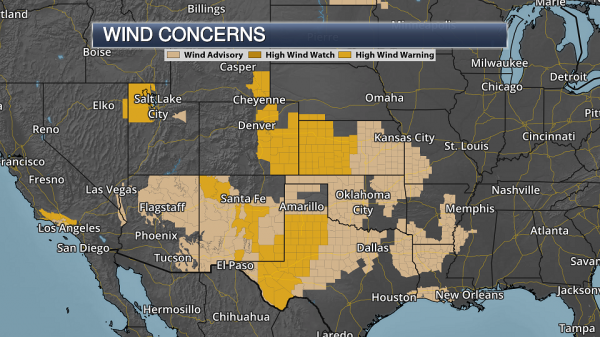 An expansive area of Wind Advisories and High Wind Warnings continue to be in effect across the Southwest into the Plains for the potential of these gusty winds. Across High Wind Warning areas, wind gusts are expected to top at least 50 mph. Xcel Rolling Out Pilot Program for Charging of Electric Vehicles At Home. Here's the intro of a Star Tribune story: "While electric vehicles have big promise, devising a cost-efficient home-charging system has been elusive. Xcel Energy discovered that the hard way after adopting a discount rate for electric vehicles in 2015, only to find that other costs were scaring consumers away. So Xcel is rolling out a new pilot program it hopes will juice interest in electric vehicles. It features a "smart" charger, which doesn't require a customer to install a second electrical meter, a potentially costly venture. The Minnesota Public Utilities Commission on Thursday approved the pilot program. "I think this is critically important," Commissioner Matt Schuerger said at the PUC meeting. "Electric vehicles are coming, and we need to have a pathway into this and evolve with it..."
Image credit: Edmon de Haro. Your Body is a Teeming Battleground. No kidding. The Atlantic reports: "...Where is the evidence that all the effort at prevention saves lives or delays death? It’s hard to find, she discovers. In people who have a strong family history of heart disease, treating high cholesterol does decrease mortality, on average. But for those who don’t have that predisposition, it doesn’t. Colonoscopies have not been proved more effective at reducing deaths from colon cancer than other, cheaper, less-invasive tests. Sometimes procedures cause more trouble than they prevent. Mammograms, for instance, detect tumors that might never be fatal, and can lead to over-treatment, which carries its own risks. The insight is counterintuitive—although finding diseases early on should prolong lives, the screenings we undergo don’t seem to lower mortality rates overall—and Ehrenreich decides that she will no longer get most preventive care..."
New Airbus Beds Will Allow Passengers to Sleep in the Cargo Hold. Well, this sounds like a good time. Details via CNN Money: "Airbus has found a new way for passengers to stretch out -- as long as they're willing to sleep in the cargo hold. The European airplane maker has partnered with France's Zodiac Aerospace to create cargo sleeper berths for Airbus A330 jets. They'll be available to airlines by 2020. The mini-cabins -- or passenger modules, as Airbus (EADSF) and Zodiac (ZODFF) describe them -- will sit directly on the cargo floor and will not affect the loading of freight and luggage. Airlines will be able to swap the sleeping modules in and out of planes in place of regular cargo containers, the companies said..."
Image credit: "The berths are "easily interchangeable" with cargo containers." Airbus. The Climate and the Cross. My thanks to The Guardian for including me in this short film focused on a rapidly changing climate and a growing awareness among people of faith who are hoping to be part of the solution: "An internal battle is simmering among US Christians over whether climate change is a call to protect the Earth, the work of God to be welcomed, or does not exist at all. Evangelicals have traditionally been the bedrock of conservative politics in the US, including on climate change. But a heated debate is taking pace across the country, with some Christians protesting in the name of protecting the Earth, seeing it as a duty to be done in God's name. ​One group has even built a chapel in the way of a pipeline and a radical pastor has encouraged his congregation to put themselves in the way of the diggers. Meanwhile, a firm supporter of Donald Trump criss-crosses the country promoting solar power. But there is still the traditional resistance – a climate scientist who denies the world is warming and a preacher in Florida who sees the fact he was flooded as a good sign of divine presence. 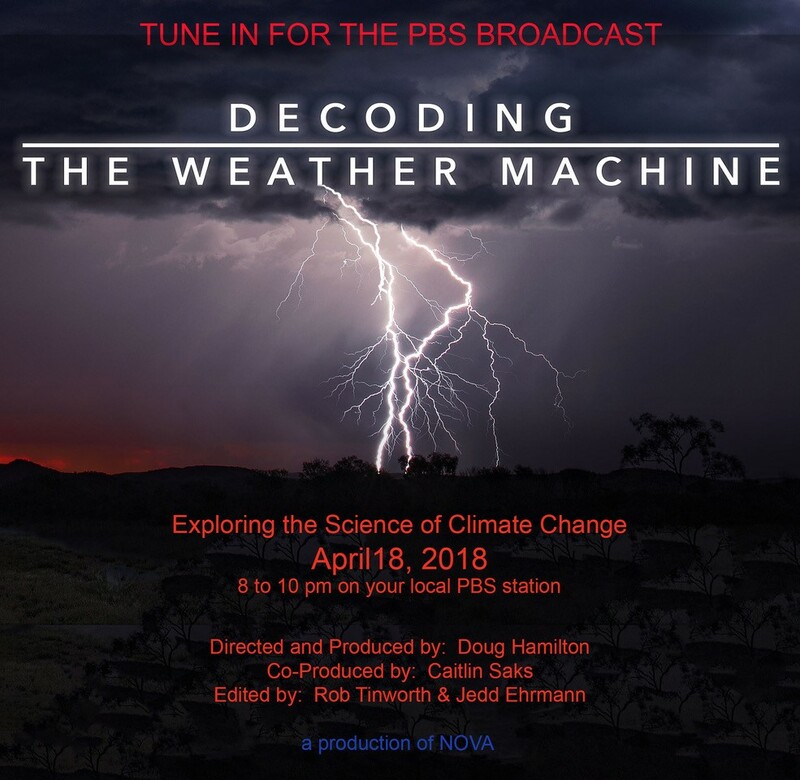 With stories from across the country featuring pastors and churchgoers, and showing conflict between generations, races and classes, could it be a surprising section of Christian Americans who could provide hope for the country's attitude to climate change?..." Global Temperature Anomalies. Temperatures are running well below average over central Canada and the central USA, but much of the planet is warmer than average. Resist the urge to look out the window at your thermometer and make global assumptions. Mike Pompeo is Warming Up to Manmade Climate Change. Quartz has the story; here's an excerpt: "...But Pompeo stepped a significant distance away from his previous views during his nomination hearing to become secretary of state today. “[I] believe that the climate is changing, that there’s a warming taking place. I’m happy to concede there is likely a human component to that,” he told Democratic senator Jeff Merkley. He added that the State department ought to be involved in combatting climate change’s national security challenges, and that he didn’t “take any fault” in commitments made in a report by the intelligence services earlier this year which warned of the threats of climate change..."
Photo credit: "Pompeo acknowledged there was "a human component" in global warming." (AP Photo/Alex Brandon). Climate Change is Messing With Your Dinner. Bloomberg explains: "The world’s dinner tables are seeing the impact of climate change. As cold regions become warmer, and warm places hotter still, farming and fishing are shifting. An evolving climate means big changes for people who grow, catch and rear for a living, and everyone else who buys and eats what they produce. There are winners and losers. There are rich-world problems (less cod, more lobster) and poor (drought and pestilence). There are threats to the quality of the world’s basic staples including wheat and corn, as well as such nation-defining luxuries as Bordeaux wine and Java coffee. And whether through dearth or deluge, supply shocks can shake up prices. As temperatures rise, the best growing conditions for many crops are moving away from the tropics, and from lower lying land to cooler climbs. Fish and other underwater catches, too, are migrating to colder seas as their habitats warm..."
Map credit: "CERES-wheat crop model based on past climate data and HadGEM2 projections for 2050. Fertilizer, water management are same in both periods." Source: International Food Policy Research Institute. A North American Climate Boundary Has Shifted 140 Miles East Due to Global Warming. Yale E360 has the story: "...Now, 140 years later, scientists have confirmed that such a sharp climatic boundary exists and that it is slowly shifting east due to climate change — a change that scientists say could have significant implications on farming in the region. The new research, published in a pair of studies in the journal Earth Interactions late last month, found the divide is created by three factors: the Rocky Mountains stopping moisture from the Pacific Ocean reaching farther inland, Atlantic winter storms bringing moisture to the eastern half of the U.S., and moisture from the Gulf of Mexico moving north and curving eastward during the summer months. The only other clear, straight divide between humid and arid areas on the globe is the one separating the Sahara Desert from the rest of Africa, climate scientist Richard Seager of Columbia University, lead author of the new papers, said in a statement..."
Gulf Stream At Its Weakest in 1,600 Years, Study Shows. CNN reports: "A key component of the global oceanic circulatory system, which includes the Atlantic's Gulf Stream, is at its weakest in more than 1,600 years, a new study has found. Research recently published in science journal Nature by the University College London (UCL) and Woods Hole Oceanographic Institution (WHOI) has found that the circulation of water in the Atlantic has been declining since the 1800s. It's a trend which could exacerbate the effects of climate change, such as rising sea levels on the US East Coast and disrupted weather patterns across North America, Europe and north Africa, including the increase in frequency of extreme weather events, like flooding, drought and winter storms..."